4. Filter of pulse air system. 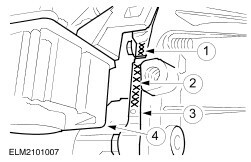 A sticker on the upper timing belt cover indicates the cubic capacity (marked 1,6, 1,8, 2,0). 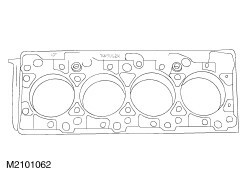 The cylinders must not be rebored: there are no oversize pistons. Ring gap positions The piston ring gaps must be spaced evenly around the circumference of the piston. This also applies to the elements of the oil control ring. Stagger the ring gaps at 120° to one another. In the 2,0 engine, the piston cooling nozzles are wide open at 4000 rev/min, causing a pressure loss of 0,3 - 0,8 bar. In the 2,0 engine, the oil pressure may therefore be at the lower end of the range. 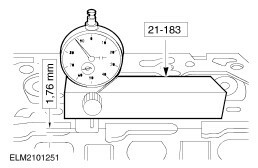 When reworking the cylinder head surface, the thickness must remain greater than 1,76 mm. If engine oils of a different brand are used, make sure these are of an equal or higher viscosity grade as compared with API/SG/CD.